Hi, I am interested in your 1960 Ford Falcon (stock #5070-CHA) listed on Autotrader for $7,995. I'd like to get more information about this vehicle and confirm its availability. Affordable honesty never looks this good anymore. 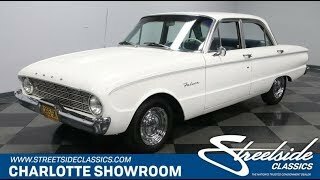 This 1960 Ford Falcon seems to buck the trend of overblown V8s, and in the process, this sedan is a true representation of the practical driver in the 60s. Just like back then, you can get a great-looking Falcon at an affordable price. This was the first year for the Falcon. The smaller Ford led the company down the path that eventually brought the Mustang, and even before that, this was known for its style. Shiny chrome bumpers, a low profile hood, and afterburner taillights give this flair. Plus, theres a great crease in the sheetmetal that starts behind the headlights and runs the profile until it circles the taillights. The full-length blue pinstripe and upgraded polished wheels (original hubcaps also come with the sale) really make this little cruiser look special. But this sedan never loses the kind of honesty that reminds us of our high school cruiser or the family car. In fact, this one looks so period-correct that if you need a movie car (or want to make a few extra $$$ renting it out) this is the perfect representation of the 60s. The hint of blue on the pinstripe is also a preview of the multi-tone blue interior. The front bench seat is something that would have been replaced on a restomod, but that wouldnt be right on this one. Instead, its a near perfect time machine going back to the days when the entire family would have rather sat in the front than had the open road obscured from the back seat. Just like any good 1960s car, this sea of blue has coordinating hues across the door panels, dash, and carpeting. All of this feels very original right down to the steering wheel. The inline-six motor has the kind of honest appearance that people love at car shows these days. Its even believed to be original to the car, and all the correct decals really back this up. And while honesty is nice, what makes this even better is that the motor was given a recent full tune-up, including new plugs and wires. Between this peppy motor and two-speed automatic transmission, you are going to love taking out your Falcon for a drive. The sale comes with the owners manual, maintenance receipts, and title documentation proving this car that has lived most of its life in desirable western states. You should probably hurry up because we dont see these in this shape often at all. And, at this affordable price, it could be headed to a movie studio any day now. Call soon!